The Fitdesk FDX 2.0 Desk Exercise Bike is a folding exercise bike with the added benefit of a desk so you can get two things done at the same time. These days, people are encouraged to get more active for the sake of their health, so the idea behind this bike of combining office work or surfing the web or gaming or other sitting pastimes with low impact exercise seems like a great idea. Aside from the desk it is a basic exercise bike with a no-frills console at a reasonable price. In our review we look at how it performs as an exercise bike as well as being used for work or leisure activities at the same time. It seems to have what is needed for a bike you can use at home or at the office with magnetic resistance, belt drive, being able to be folded up to save space and being adjustable to fit a range of different heights with a desktop. The steel frame is sturdy and there is no flexing or moving around when you are on the bike. It doesn’t wobble or rock when set up on a flat surface. 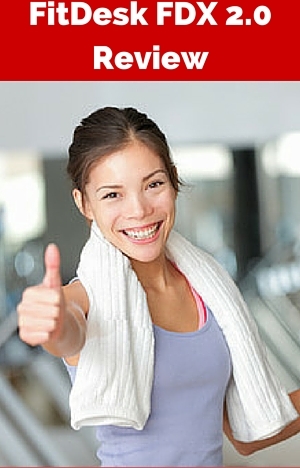 This allows you to exercise and do whatever else you want to at the same time with confidence. It can move a little from side to side when getting off the bike but it is unlikely to fall over unless you were very aggressive with it. It does need to be used on a flat floor as there are no levelers to balance out the bike if there is an unevenness in the floor like you might have in garage or basement. The manual has some specific maintenance / checking that needs to be done after a certain number of miles have been cycled to ensure all continues to well. It is minimal and is what you would be expected to so with any indoor bike. According to their site they offer a lifetime warranty on the frame and 1 year on the parts. The bike is recommended for people between the heights of 4 ft 10 ins and 6 ft 5 ins. Only the seat can be moved up/down. The desktop height can’t be changed but it can be adjusted horizontally. The seat adjustment does go up/down on an angle to make an allowance for different torso/arm lengths and along with desk movement means that you shouldn’t end up having to lean too far forward to type. It is quick and straightforward to make the adjustment to the seat. You loosen the pull-pin knob on the seat post, pull it and then slide seat to the position you want and then insert pin into the pre-set hole and then tighten up. The pre-set holes can sometimes mean you just can’t quite get the height you want but it does keep the seat safe from slipping while you are on it. As with all these bikes when you get to the lower end of range of heights some people can struggle with reaching the pedals comfortably. But some of this may be due to them installing the seat extender which increases the height of the seat for people over the height of 5 ft 9 ins. It is not needed for below that height and increases the lower height the seat can be adjusted for. Having to add the seat extender is easy to do when assembling for taller users but does reduce who can use it as it increases the effective user height to 5 ft 2 ins. Adding or removing it between users is too much work and takes too long so will stop the bike being shared if you have one person over 5ft 9 ins and one below 5 ft 2 ins. It has 8 levels of resistance marked on the tension knob that is just below the desk on the desk post. You turn it clockwise to increase resistance and counter-clockwise to reduce. It is easy reach and is not difficult to turn. It moves magnets closer/away to/from a flywheel (enclosed) to increase/decrease the resistance. There is no touching parts so it is low maintenance and no noise generated. You can get a reasonable amount of resistance as you turn it up to 8 but it is more like an incline than a steep hill making it ideal for light and moderate exercise rather than high intense workouts. This is what is designed for rather than serious training – increasing activity levels and getting the health benefits from that. It can help with keeping/getting your miles up for indoor bike training but not for hill work or sprinting. At higher resistance levels of 7 and 8 the cycling motion is not that smooth it becomes a little choppy which is harder on the knees – this is due to the pedal stroke speeding up when you are pushing and then slowing as you move round the top and bottom of pedal stroke. There isn’t a foldable exercise bike with desk design (I’ve come across) that you can get an intense workout with. You could purchase a spin bike and add a bicycle desktop to get the more intense raining you can get with these -where the resistance goes up high enough that it is like going up a very steep hill. The bike has a double belt drive which provides a smooth consistent feeling. It is very quiet and low maintenance. It is enclosed as is the flywheel so it is out of the way of pets, children and you won’t get your ankles or clothes caught in it. It also protects it from dust and sweat. The pedals are made of a sturdy plastic that has a non grip surface with straps to keep your feet in place. You don’t have to use the straps and your feet shouldn’t slip off them. The pedals are at an angle out in front of you rather than underneath as you get on an upright bike or outside bike. It can seem a little weird at first if you are used to those other bikes but it doesn’t take that long to get used to. Most people find it a comfortable position and it takes a little pressure off the legs – not a much as a full recumbent but similar to a semi-recumbent bike. Seat. This is a cruiser style bike seat which is about as comfortable as you can expect from a stationary bike seat. Some people do find it comfortable and can sit on it for couple of hours or more. But as comfort on the sit bones is such a personal thing not everyone is going to like the seat and my find it just too hard for them. It can take a little time to get used to it if you’re not used to riding a bike. Some people can struggle to get on the seat if they are short or have issues with mobility. It can be difficult to get the leg over the x-bar which involves lifting the foot about 2 feet up – a small step can help. Reading when on the bike is not like when you are in a car, where you can get motion sickness, becauses you aren’t actually moving there isn’t the confusion between the brain and inner ear. The back of the seat can be tilted a little for comfort when you are sitting back in the seat in a more recumbent position. Handlebars There isn’t a standard handlebar on the bike but an arm rest or massage bar that helps to keep your arms from getting sore from typing. You can also release tension in your forearms by rolling them on the massage bar. It can also be gripped and used as a handlebar if you just want to exercise rather than combine it with other activities. It also useful to hold when getting on and off the bike. Noise The bike is very quiet. You can watch TV without having to turn the volume up. If you’re having a phone conversation the people at the other end won’t hear it, the only thing that might give it away is your breathing if you are pushing yourself while on the phone. You can use it an upstairs apartment and you neighbors are unlikely to be complaining about you using it. If you are still concerned a rubber exercise mat should stop any slight movement or noise transmitting through wooden floors. You could use this in your work office, it is quiet enough that it won’t disturb others in the office although you might get some funny looks to start with but you’ll be the one that’s having the last laugh as you improve your fitness and health! Dust and Dirt There shouldn’t be much, if any dirt and dust from the bike. There may be some sweat that drops from time to time depending on how hard you or others push themselves on the bike. To keep the bike working well and looking good it is important to wipe the bike down from sweat and to protect the floor a rubber exercise mat is a good idea. The bike is compact already but can be folded down to 3/4 size so that it can be easily stored out of the way when not in use. Folding it up is quick to do. You pull on the pull pin on the frame to release, close the frame and pull pin when click into place to secure it in place. The bike has small transport wheels on the back stabilizer bar that work well on hard floors and most carpet but can get jammed up on deep pile and softer carpets. To use them you tip the bike backwards on them to hold most of the weight of the bike (47 lbs) leaving you to push/pull and navigate the bike. It should take less than 2 hours to complete with most people completing it within 30 to 60 minutes. It’s not as tough as putting IKEA furniture together. There is a lot less parts. They are all machined properly and fit together easily apart from the seat which is more about it being awkward to reach than not fitting together. The assembly instructions are adequate but they could have used a better numbering sequence and diagrams. Fortunately it isn’t difficult to work it out. There was some problems with the tool they included initially not being the right size for the seat fitting but they have since altered it. The owner manual has an exploded diagram of all the parts of the bike at the beginning which can give the impression that you’ve got a big job on your hands. I’m not sure why they’ve put it there at the front other than to give you a bit of a fright. It’s only there for information purposes and to number the parts. The tools needed for the job are included but if you have your own tools this will make it quicker and easier particularly when attaching the seat. A good thing they have done to make it even easier so you don’t have to spend your time measuring the hardware or counting it out is the mounting hardware is located on the parts to be installed. This is a basic console that can help you keep track of how much exercise you are getting through. It tracks time, distance, calories burned and total distance. You can set the console to track one of the measures or have it scan through them all. It starts by itself when you start pedaling and will turn off when there is no activity for 5 minutes. It does keep your latest position for you when you start again but this can be cleared off by pushing the mode button underneath the display. The location of the console at the front of the bike is easy to see except when you have a laptop on the desk then you can’t see it. You have to move the laptop or close it to check on how you are getting on. This can be a little annoying especially if you are a numbers person. It does put it in your eye line when you are watching TV or playing video games, if you want to keep it out of the way you do need to set it up so the TV screen is off-center or if you can live without the measures you can remove it – which is easy to do. The numbers are large enough to see without straining except it isn’t backlit so it can be a struggle to see them in poor light conditions. The big benefit of the bike is the desk that sits at the front of it where the handlebars normally are found. You can be busy getting your work done or relaxing while getting some exercise at the same time. The 16 by 19 ins desk can fit up to an 17 – 18 inch laptop but it doesn’t leave room for an external mouse, this is the same if you have a full keyboard there is no room to fit a mouse at the side of it. It does have room to have your phone alongside it. It has non-slip surface and a lip to prevent a laptop or tablet sliding off it. There is also strap included to hold the laptop on to the desk. As noted earlier the bike is solid so there is little movement of the desk so the laptop or other items should stay put. The desktop can be moved towards and away from you to help with getting the most comfortable position. Whether you lean back in a more recumbent position rather than upright or slightly forward the desk can be brought closer to you. Although this is not enough for everyone – to get it closer you can place the laptop, tablet or other item on the massage bar and desk. You can leave the desk to slide while you use or you can use the knobs underneath to fix it in place. The desk is not suitable for a desktop computer but you can set this up so you can use it by placing the monitor etc on another desk or table and use the keyboard and mouse (with extension) as you might do if you were playing video games. The massage bar at the front of the desk is there to help with keeping the arms relaxed by resting them on them rather than leaving them unsupported. You can also roll your forearms across them to reduce tension build up in them and keep the blood flowing. This feels like is made from a cheap plastic but it seems to be able to stand up to use without breaking down. You can use it in three positions – from level to above the desk height for your comfort. Under the desk is a small drawer that can be used to store a phone and a few pens. It is a little flimsy but with a little care it can be great for keeping things close at hand but off the desk surface. There are also a tension bands with handles just below the seat that you can use to exercise your arms when you are taking a break from typing or gaming etc. They do feel a little like an afterthought but can be effective in giving your arms activity. Also, the company has a range of accessories to help in getting a more comfortable ride. The one that most people go for is the desk extension which adds room on the side to include an external mouse plus it has a drink holder and mouse pad. It fits on both sides of the desk, is made of non-slip surface but they are, a little annoyingly, raised up from the main desktop. It is easy to add to the existing desk and does provide a lot more room. In addition (bought separately to extension) there is a document holder for your papers you can use with the desk extension to hold your papers in place vertically with a clip at the top to make them easier to read. You can also buy a water bottle holder that clips on to the massage bar and the company does mention there is a bike seat adapter you can buy but I can’t see that listed on their site and on Amazon it is currently unavailable. There are some instructions on how to use the resistance bands for exercise but there is nothing on how you can get the most out of the bike in the manual – I’d like to see something on how to set up the bike for full range of motion for the knee, on the desk positioning and some stretches as a minimum and how often you need to do them. After reading over 200 reviews it is obvious many people have found this a very good buy. It is seen by many as a piece of equipment that they actually use regularly rather than one that sits in the corner gather dust or being used as a clothes hanger. Many people say they are recommending it to their family and friends. There have been some issues with quality control at some stage (in particular a clicking noise that has now been resolved) noted in some reviews. Often times the supplier responds quickly to sort any issues but appears not always. But these are few in number with the majority very glad they bought the bike. This is a well put together bike that is a space saver made from quality parts as noted by other customers. It is more expensive than other folding exercise bikes but they don’t come with the desk or resistance bands – this provides a lot of convenience and you are more likely to use it because of this. When checking it qualified for Prime and free shipping on Amazon. The bike may be one of the best examples of multi-tasking that both men and women can do and benefit from. You can increase your activity levels to get in shape, stay in shape and burn calories to help with weight loss. As well as that you can complete work or watch TV, play video games or any other sitting down activity. Of course, you can just exercise too if you want. This is the big benefit over many other pieces of exercise equipment people buy – it is one that actually gets used. It’s not designed for intense bouts of exercise but for getting the benefits of light exercise when you’d usually be sedentary and we know now the problems that can cause to our health. It is a good solid quiet bike for exercise. work and other sitting activities at the same time making it ideal for home or office. I am 6 foot 2 ins with extra long legs, and I can only JUST fit onto the bike with the seat extender installed. So to say it can handle someone up to 6 ft 5 ins would only apply if that person had short legs. My knees clear the front desk by 1/2 inch. Assembly was fine except for one bolt t the front of the saddle that can’t be tightened with the supplied tool. So far in use the bike is great, takes minimal space, is very quiet and does the job.